SAN DIEGO, April 9, 2019 /PRNewswire/ -- Blackmoon Financial Group, a blockchain Financial Service and Fintech firm, and BLOCK 30 Financial (a wholly owned subsidiary of BLOCK 30 Labs), today announced that they have formed a global strategic partnership to create a BLOCK branded suite of Exchange Traded Index (ETX) products on the Blackmoon platform. 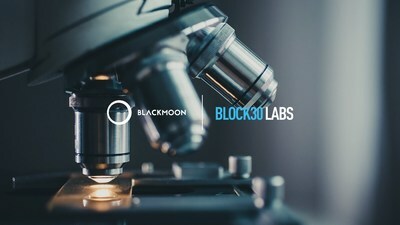 "BLOCK 30 Financial is thrilled to partner with the Blackmoon team to expand our reach to global investors," said Brian Foote, CEO of BLOCK 30 Labs + BLOCK 30 Financial. "We'll start first with the BLOCK 30 Index ETX and move quickly across a variety of BLOCK indexes across multiple asset classes, in this unique tokenized, digital format." "We did 16 months of due diligence around cornerstone global partner selection for the BLOCK 30 Index ETX launch and we just came away feeling like the financial engineering and product agility at Blackmoon is literally years ahead of the traditional markets," Foote said. "We're honored to partner with them." "Whether its tokenizing the Lyft IPO for investors outside of Silicon Valley or challenging the 'yet another Mutual Fund mindset' of Wall Street, Blackmoon is exactly where we wanted to be in terms of offering new financial products for global Millenials + Gen Z," said Jeff Hinshaw, COO of BLOCK 30 Financial. "57% of customers around the world are not investing in the markets right now. They're tuning out on white collar fee loads, product redundancy and a lack of imagination in the financial markets…Blackmoon is paving a new way forward with Exchange Traded Index (ETX) products and we wanted to work with them to deliver that for millions of potential customers around the world." Blackmoon aims to create and maintain the world's best framework for tokenized investment vehicles to deliver investment opportunities in both the real world and the blockchain universe. Blackmoon Platform brings blockchain flexibility to fiat instruments and the benefits of accumulated financial wisdom to the crypto investments. Block 30 Labs (https://block30financial.com/) was built to provide a central framework for the tracking of the 24/7 Digital Trading ("Crypto") markets by global media, financial institutions, government and investors. Drawing on historical insights from the Dow Jones Industrial Average (DJIA), the S&P 500, and other global indexes - the BLOCK 30 Index was constructed using a multi-factor approach, to reflect the overall health of the market, its business cycles and the movement of both individual digital assets and thematic sectors in real time. Unlike other Crypto indexes, the BLOCK 30 Index considers a proprietary blend of critical input factors, such as Market Cap, Price, Circulating Supply, Sector Weighting and Trading Volume.